Paula Radich was GREETER today! FYI – Kiwanis International is an international service club founded in 1915 in Detroit, Michigan. It is headquartered in Indianapolis, Indiana, United States, and is found in more than 80 nations and geographic areas. The Newberg Kiwanis Club’s primary focus is on service to the youth in our community…and globally. 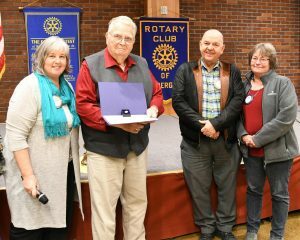 After Jim McMaster led us in the Pledge, Om obviously enjoyed “playing the room” and had each person introduce themselves, identifying whether Rotarian or Kiwanian. We also had Judy Robinson’s daughter, Andrea Johnson, Tigard Rotarian…and Densie Bacon’s guest, Bayaon Ware. Bayoán grew up in the Chicago-area. In 2011, he earned a bachelor’s degree in Environmental Studies from Oberlin College. 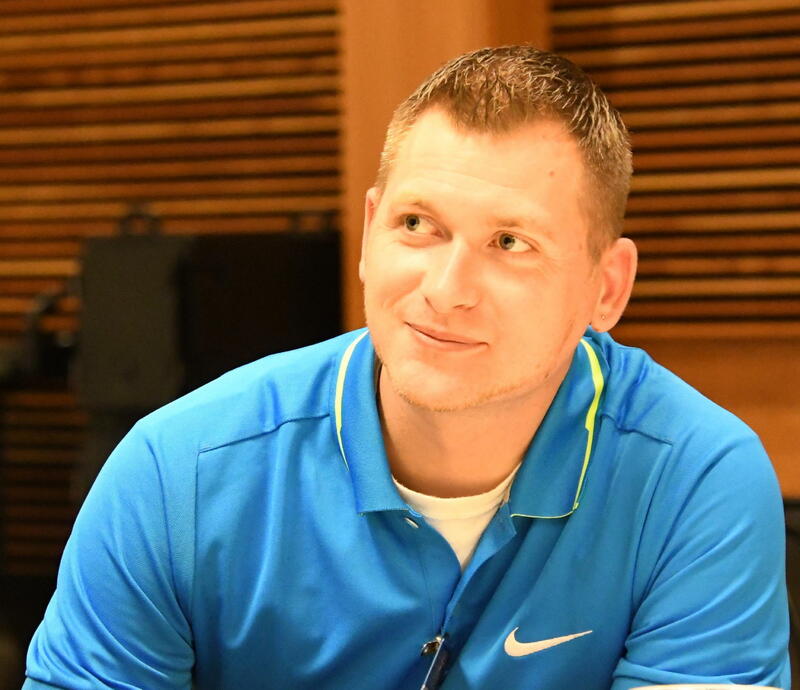 In 2013, he earned a master’s degree in Early Childhood Education from Relay Graduate School of Education. 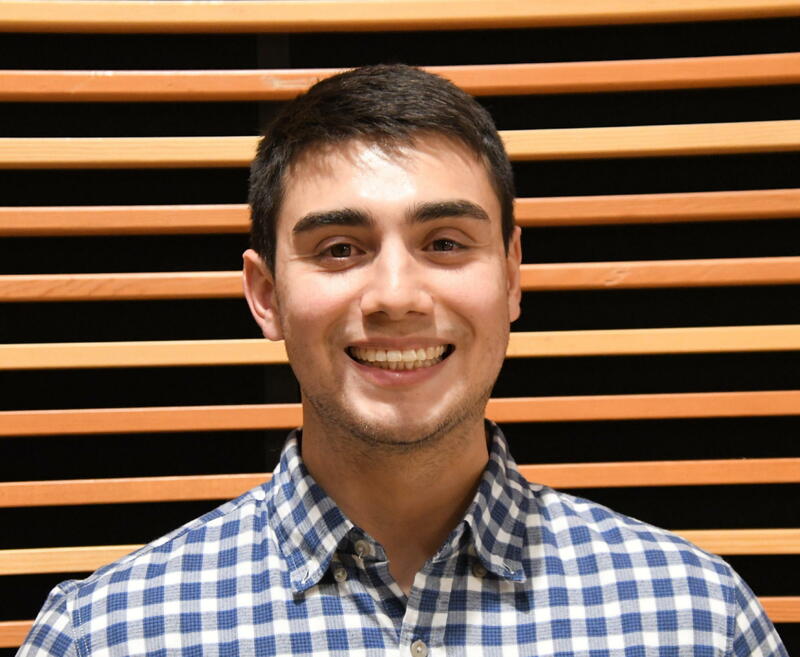 “I am blessed to be welcomed into the strong community of Newberg and look forward to serving with and learning from the wealth of knowledge it has.” For an expanded “bio” on Bayaon, and his role as Community Visioning Coordinator with the City of Newberg, go to the City’s website. Dale Welcome touched on a water project in-the-works in Uganda. Auggie Gonzales: Dates for Rotary Guatemala Mission Project are March 1 thru 8. Spanish not a prerequisite but helpful. Contact Auggie at: auggiegonzales@yahoo.com if you have questions or are interested. 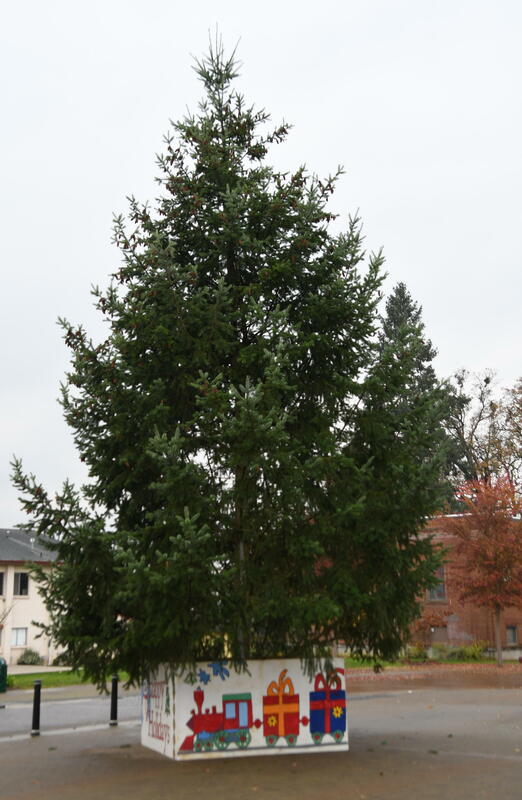 Leah Griffith: City got the Christmas Tree UP…now it is almost time to light it! The 34th Holiday Tree Lighting will be held on Saturday Dec 1st with Santa arriving at 5:15. This event, put on by the Library, is supported by the City, CPRD, PGE and noon Rotarians and Interactors. This years marks Leah’s 27th…and last…Tree Lighting as the Library Director and also Mayor Andrew’s last as he finishes his 12 years in office. Leah also reminded us of of our primary fundraiser, the AUCTION* coming up in March…needing EVERYONE’S HELP! SO SIGN UP! 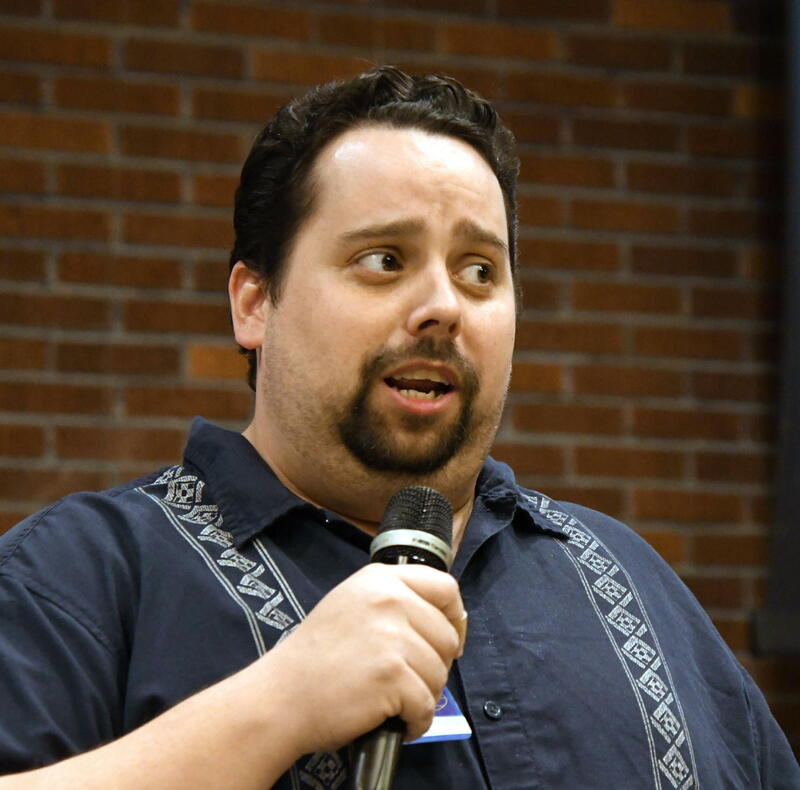 Walter Want spoke of the upcoming City Open House for the Waterfront Project, mentioned at the City Club meeting….Newberg Riverfront Master Plan meeting, Public Safety Bldg, 401 E Third St. December 4, 2018 at 5:30 PM. 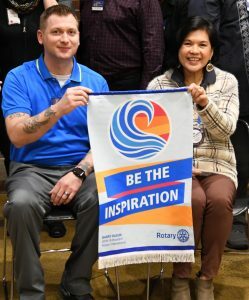 Mike Caruso: The theme of the Rotary Institute in Reno was: ‘Partnerships Work’ and it focused on how Rotary has realized that working with “partners” has so many benefits over working alone. 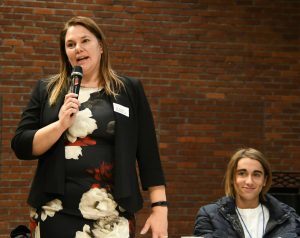 The partners who shared with us at the Institute were groups like, Mediators Beyond Borders International (MBBI), The Bill & Melinda Gates Foundation, Peace Corps, Institute for Economics and Peace, as well as several larger corporations and universities. 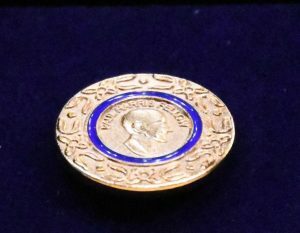 Regarding the Rotary Club of Paradise, California, every night at the gala reception there is a table centerpiece which goes to the highest bidder at the table for auction with the proceeds going to Polio Plus. This year the proceeds went to help the victims of the Campground Fire that demolished Paradise. The total raised was $10,000. Heather Lewis: Key Club International at NHS is having their Annual Holiday Help Drive requesting donations of personal care and hygiene products to the NHS Resource Room. All donations can be dropped off at the NHS Main Office. The drive will end Dec. 16th. Prez Om: It has been agreed among board members that every third week of each month we raise money for Polio Eradication. Recent stats: Number of Wild Poliovirus Cases Globally as of November 20, 2018…New Cases Last 7 Days 0…YTD – 2018 27. THEN….we had a little additional FUN in raising some more $$$ toward Polio Eradication….in another “Wine Walk”…as opposed to a “Cake Walk”…but basically the same rules! 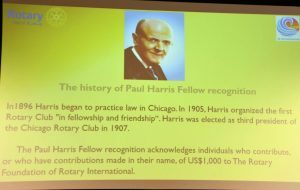 Mike Caruso gave some background information on Rotary’s Polio Plus [now…Eradication] efforts started in 1985…then got the needed 20 players assembled, both Rotarians & Kiwanians…Paula Radich handled the music, and around they went….with Judy Robinson and Walter Want apparently vying for “best moves”! 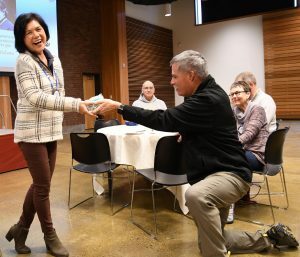 AND THE WINNER WAS….Anne Lee, Kiwanian at left in ORANGE, who came away with a great bottle of wine…cheerfully presented to her by Mike Caruso!! FOLLOWED BY…..Jim McMaster offered a special donut to Om……Uh….Jim……what’s the green stuff on/in the donut!? Then Jim elaborated on the barkdust spreading activities of the 17th…also giving us a bit of history and update on the Chehalem Parks & Recreation District…”Parks & Rec.”..from his 39 years’ perspective. 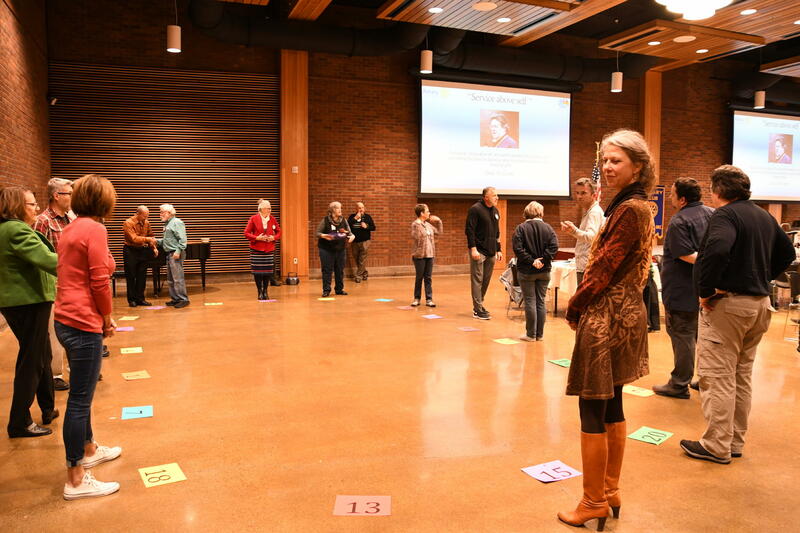 21 parks in the County…in Newberg & Dundee. The latest park going in costing about $700K. The Cultural Center is owned by Parks & Rec…and is going to experience expansion with a “warming kitchen” to make meal prep much easier. Additional expansion in the works at the Aquatic Center site…Jim also spoke on the emergency at the POOL on the 20th, having to do with the equipment…resulting in emergency crews called…taking action…and resolving the issue[s]….all very professionally. Jim then re-introduced Matt Compton from Parks & Rec., with an in-depth update as to sports activities in Newberg & Dundee. Hundreds of students are involved! For additional details, check their website. Matt also gave KUDOS to fellow activity coordinator, Julie Petterson [not present], regarding the MANY kids in the programs she oversees. Upcoming: The program for Nov. 28. will be Todd Engle & Corey Forte giving an update on the CNA Program at Friendsview in cooperation with Newberg High School. 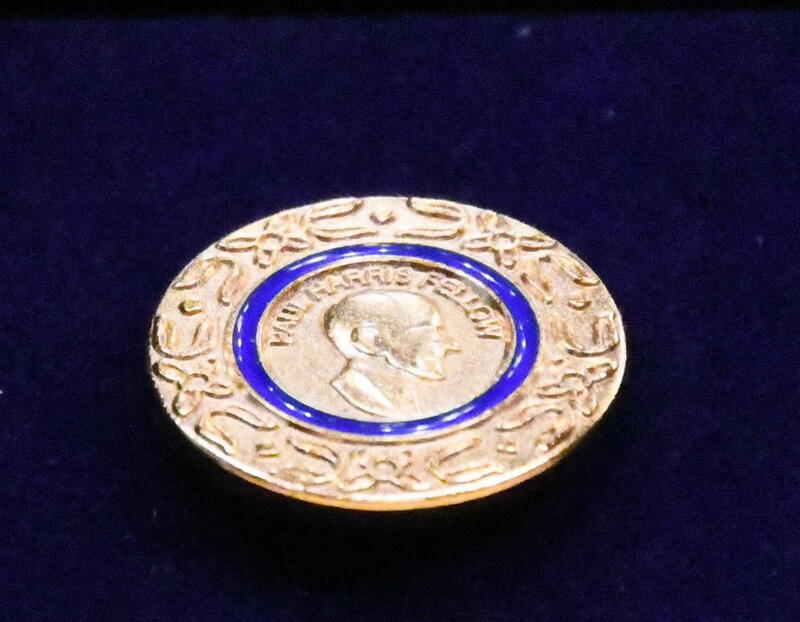 The Membership Committee will meet that day from11 AM until Noon…and the *Auction Committee will meet after our regular meeting from 1 PM – 2 PM….both at CCC. 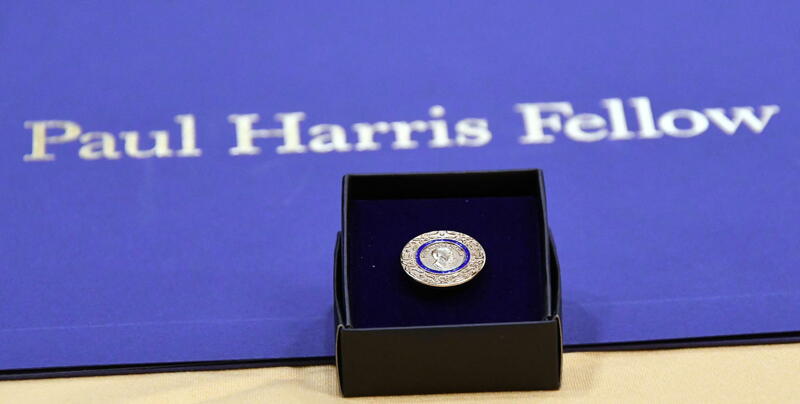 The program for Dec. 5, will be the Classification Talk by new Rotarian, Patricia “Trish” Hornback, PhD. NOTE: Newberg Kiwanis have invited us to join a holiday celebration with them on Thursday Dec. 20th at their noon meeting at the Cultural Center. THEREFORE there will NOT be a regular Noon Rotary meeting on Wed. Dec. 19th. 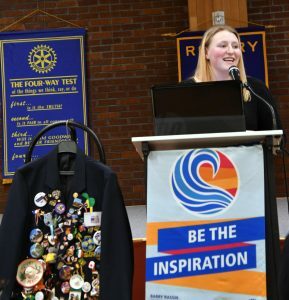 Being her usual INSPIRATIONAL self, President Om closed out the meeting by having Kiwanian President Jack Maxwell ring the Rotary bell! Let the Four Way Test of Rotary be YOUR…INSPIRATION! Dale Welcome welcomed us grandly today as GREETER! Prez Om was excited about the standings in the State for the local swimmers! And…a proud MOM! With photos on the BIG SCREENS! 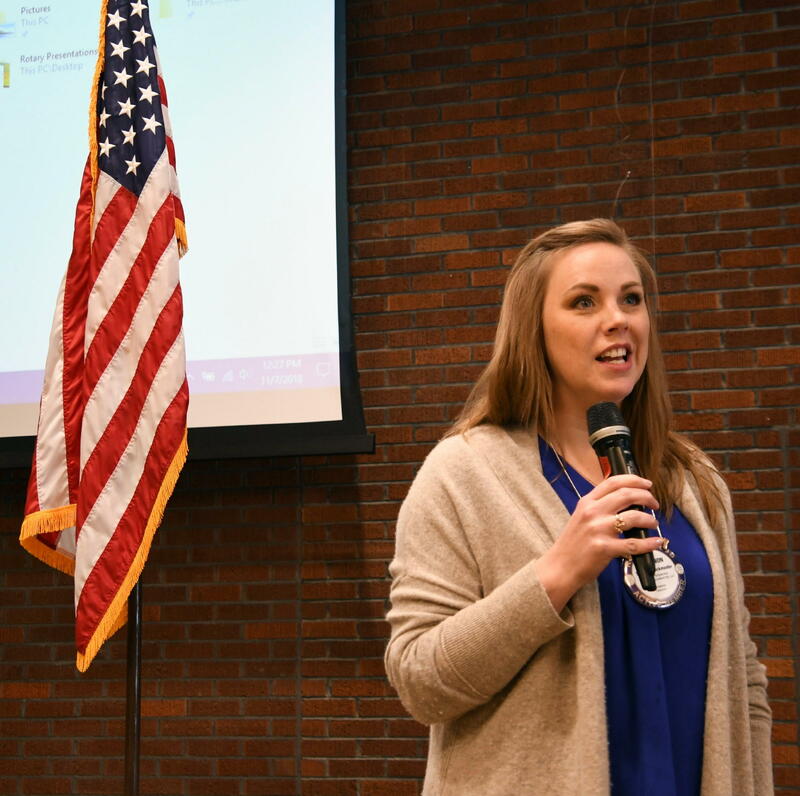 Laura T. led us in the Pledge….and if you hadn’t noticed…our meetings are B U S Y !!!! So, hang onto your hat and let’s get to it! Lots of guests today! Marvin Robinson [husband] & Michael Summers [their pastor] as guests of Judy Robinson; Rosa Ruiz [Mexico] & Matteo [Italy] are in-bound exchange students; Chloe Bridges and Sarah Hess have returned from their trips to Italy and S. Korea….stories to be shared with us today. Also present were John [an Earlybird Rotarian] and Debra Bridges, Chloe’s proud parents. “I am fortunate to travel around the world on a regular basis and it leads me to many adventures to interact cross culturally in many meaningful ways. 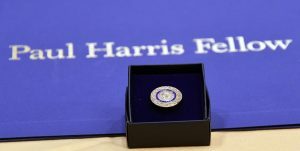 For me, being a Rotary member and working as a vocation in the humanitarian sector have so much in common; ‘service above self’. Those words, ‘service above self’, are powerful reminders of our humanity and responsibilities that extend far beyond ourselves to our local community as well as around the globe. The circumstances and living conditions I see when I travel and conduct field visits always have a profound impact on me as a reminder of just how blessed we are in Newberg, OR. In Sept, I visited the Azraq Refugee Camp in Jordan just 10 miles from the Syria border. The camp houses over 40,000 refugees, 60% of whom are children, and is one of the better camps serving Syrian refugees in terms of living conditions. Azraq sits in the middle of the hot, dry desert with only the horizon looming in the distance and no communities or towns nearby. Much of the population of the camp have lived in Azraq for years with young children only knowing life in a camp. The Syrian family I visited with had fled Syria over four years ago after the conflict killed their two boys, ages 10 and 12 at the time, and their farm was overtaken and destroyed. The father, Anand, reminisced of their farm, livestock, crops and family that they have long left behind. Days in the camp are spent with the parents of this family caring for their four year old and six month old girls but with little do but to sit in their hut, occasionally visiting new friends found in the camp and longing for a day when they can return to Syria. Life in the camp is hard, boring and very unfulfilling leaving me to wonder how much hope can there be for the future of these two little girls. The DUCK – Becky Ankeny did her usual good job of gleaning $$ from Rotarians for their opportunities to brag, complain, or otherwise make known publicly something that happened to them recently. Om gave kudos to Jim McMaster for his guidance/coaching of the NHS Swimming State Champions! Shannon B. complimented Ray H. for being the only man at a table full of ladies! And Ray letting us know he & spouse are headed on a trip to the Phillipines…speaking of which…did you know…The Philippines was named in honor of King Philip II of Spain. Spanish explorer Ruy López de Villalobos, during his expedition in 1542, named the islands of Leyte and Samar Felipinas after the then-Prince of Asturias. Paula claimed she couldn’t keep up with her 100 year old Mom on a recent shopping excursion in Portland! Stephen Palmer thanked us for the card congratulating on his recent marriage. Dan Keuler and his wife are welcoming their second child next spring. Congratulations! Auggie spoke of our dental clinic project in Guatemala. There were other some “brags/announcements”, but Becky was getting around the room too fast for me to keep up with note-taking! “Hi! My name is Rosángela ,but you can call me Rosa, and I’m the exchange student of this year. I’m from Oaxaca, Mexico. I’m 17 years old. I’ve wanted to be in an exchange since I was a little kid, my dad persuaded me to do it. Now I’m here and I’m really enjoying it, at the beginning it was hard but everything gets better with nice people. Despite Mexico is close, living here is different and challenging. I’ve only practiced two sports in my life, swimming and volleyball. My favorite sport is swimming, I’ve been practicing for almost three years. Swimming have me amazing friends. I also like scouting, I started when I was 11 years old and I can say that every moment there is and adventure. We do many activities like volunteering and camping. I love it! My favorite classes are chemistry and biology, I want to study something with them when I grow up. I’m glad I’m here. To be honest United States wasn’t one of my options but everything has a reason. I’ve been having an amazing experience so far, and I really want to learn as much as I can, this is my year and I have to enjoy it”. Yours truly surprised Sarah by greeting her in Korean [I was there for 13 months, 51 years ago, and worked closely with Korean soldiers!]. She was hosted in a city in the very south of S. Korea, somewhat west of the large city of Busan [old name “Pusan”]…a very large port city. She participated in an art school that met evenings….and provided us with quite a few photos showing her Korean families and friends and their many activities. While in Korea, she traveled to many sites, including the DMZ. S. Korea is a bustling nation, with the 5th largest economy in the world. 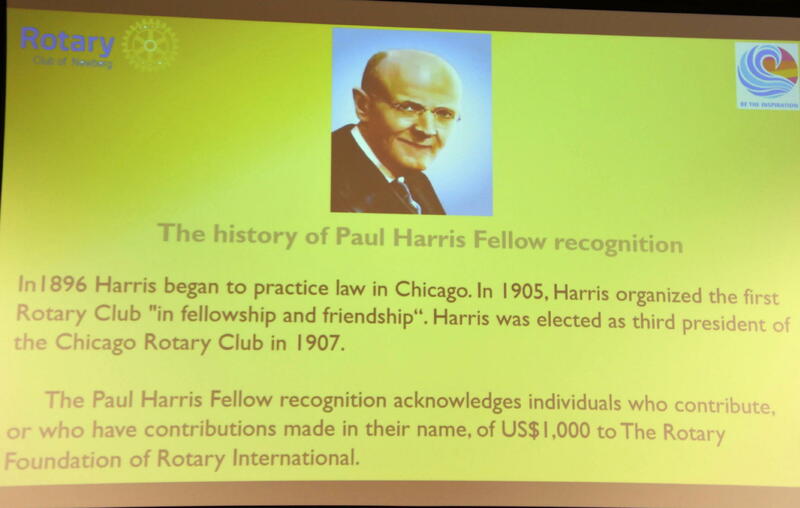 And Rotary has been an important part of their culture for decades. The population of S. Korea is 51+ million, with nearly half of that residing in the nation’s capitol, Seoul. By contrast the entire population of N. Korea is about 24 million…and the total land area of the two nations combined is about half the size of the State of Oregon. Sarah’s proud Mom, Michelle Bechtold, extolling the positive advantages/results of Rotary’s International Student Exchange Program. 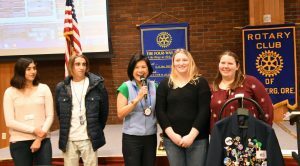 Rotary’s International Exchange Student Program is truly INSPIRATIONAL! Prez Om closed the meeting by having the students “ring the bell”! Paula Radich cheerfully greeted us again today! HEY! Being “GREETER” is a FUN thing to do….so sign up! Our always excited Club President, Om, opened today’s meeting! AND…Om is a new Paul Harris Fellow…. [Mike Caruso says specific details to follow at a later date.] That’s our PREZ! Thanks to Jim McMaster for leading us in the Pledge today! 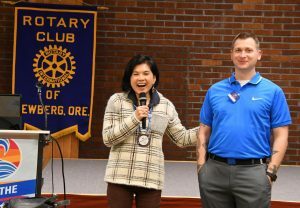 Rod Federwisch Rotarian from the Earlybird Club was our one visitor today. Welcome, Rod! Jim McMaster: Most noteworthy aspects of his son Spencer’s time with the Peace Corps in Africa for right now are…the heat & the snakes!!! Leah reminded us again of the Christmas Tree Lighting Ceremony scheduled for Dec. 1, 4:30 – 5:30 PM at the Cultural Center. Yours truly related my auto accident of Nov. 3, about three miles south of Forest Grove, marking the untimely demise of my much-loved 32 year old Volvo wagon, “Goldie”. Thankfully, no injuries. On a clear/open country road, the other driver slowed down…stopped…then with no warning, BACKED his travel trailer up into the front of my car! WHAM – radiator & headlights M U N C HED !!! ’87 Volvo “totaled”. Not my fault…appropriate settlement to follow soon, I hope. Gene Piros announced he and his wife just celebrated 44 years of marriage! Way to go! Auggie related his own recent car damage “incident” at the hands of a young “newbie” driver while the car was parked at his clinic! 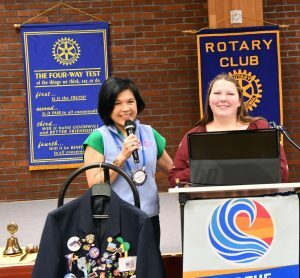 Laura T. spoke of needing candidates for Rotary International Youth Exchange…so…if you know a qualifying student…let her know! Judy Robinson had discussed with D.G. 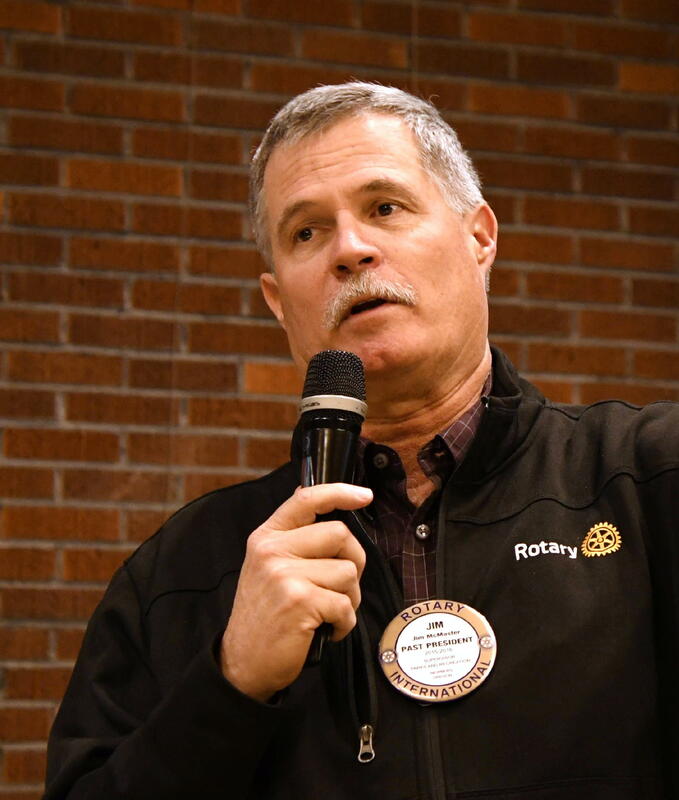 Larry Hatch about contact info for the Rotaract and Interact clubs that are the most active. Which happen to be Forest Grove for Interact and Silverton for Rotaract. Her goal with Interact is first to contact them, then try to arrange for their Interact representative to speak to our club. 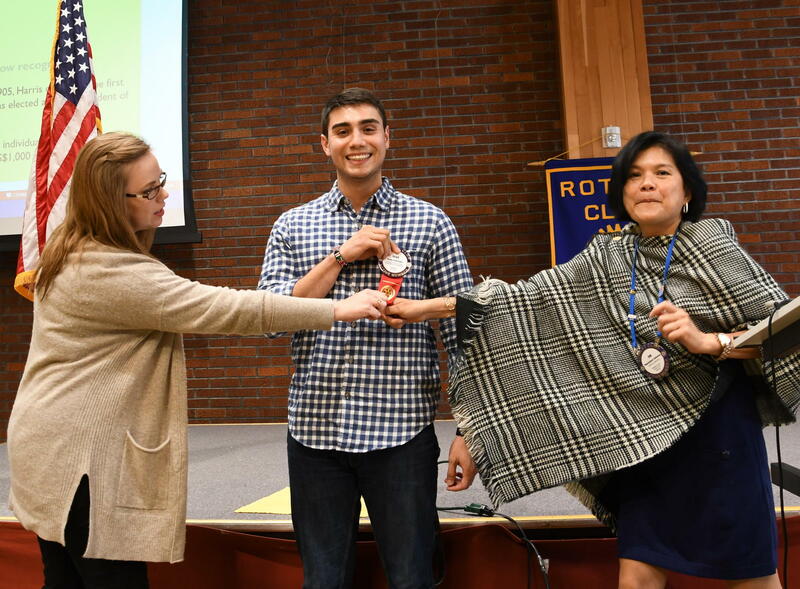 Om is taking the lead on the Rotaract subject, with an objective of getting a club started at George Fox U. More details as they surface. AND Leah G. reminded us of the IMPORTANCE of everyone signing up for volunteering to help with our PRIMARY FUNDRAISER…the AUCTION, scheduled for March 23, right here in the Chehalem Cultural Center…a change from last year that should mean a better financial return on our efforts as the costs will be less than in the past. We will have the entire Cultural Center available for that event. What is needed NOW is for all Rotarians to sign up to help! Sign-up sheets were present at each table. Ray Hillman handled the DUCK this week,…managing to collect generous $$$ contributions from several Rotarians present…including Corey Z. who was pleased that Measure 102 passed, meaning good things for low-income housing projects in Newberg and elsewhere. I am Ivan Estrada, and was born and raised in Irrigon, OR. 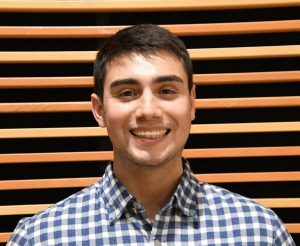 I currently live in Newberg, and work at Yamhill County Public Health, where I act as the Drug, Suicide, and Gambling Prevention Coordinator. 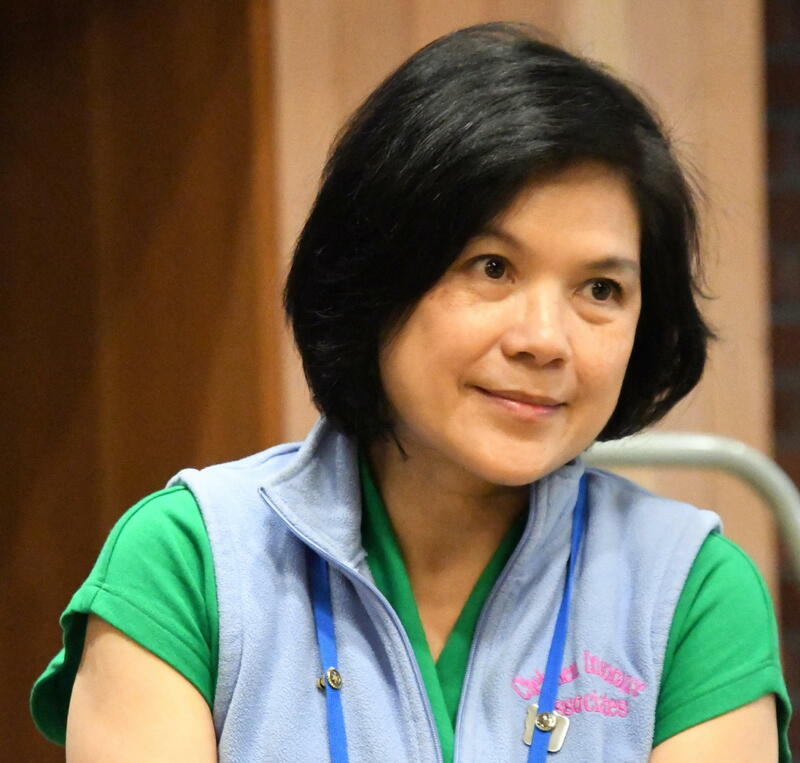 My interests in public health began during my undergraduate career at Oregon State University, and continued through my graduate work at George Washington University. Eventually, I hope to return to school and pursue a PhD and become a public health educator and researcher. One of the reasons I love what I do is because I get to work alongside community members to improve the health and well-being of their communities. When not working, I can often be found indulging in one of my many hobbies, which include hiking, board games, wining & dining, running, listening to music, and playing soccer. 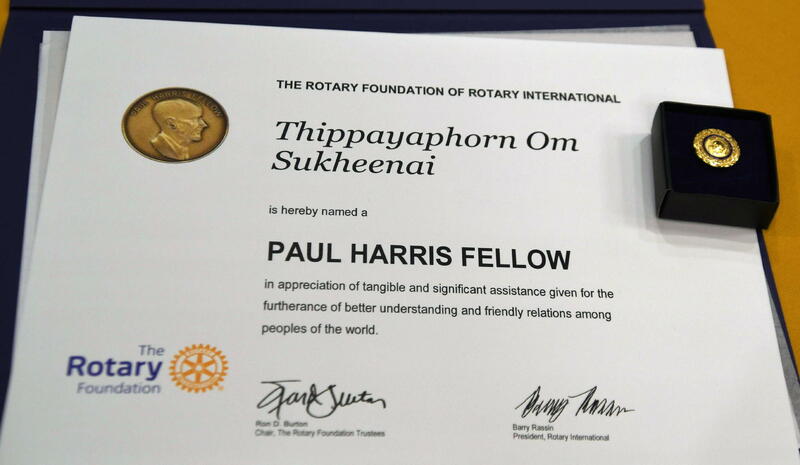 I am thankful to have the opportunity to be a part of Rotary, and look forward to all the relationships and good that grow from them. I have a girlfriend and two cats. And my grandmother makes the BEST tortillas, the old-fashioned way! Glad to be on-board with Newberg Noon Rotary! After Ivan’s talk, Shannon and Prez Om “cooperated”…sort of…in removing Ivan’s red “new member” ribbon! Thanks, Ivan! And welcome again to ROTARY! May your days be guided by Rotary’s “Four Way Test” of the things we think, say or do! Prez Om closed with her usual enthusiastic reminder to…. Rotary Meeting on Wednesday, October 31st. Prez Om started off our meeting reminding us of Rotary’s efforts for peace, especially in light of the recent events in Pittsburgh and North Carolina. Announcements included Jim McMaster’s plea for lots of service help on Saturday, November 17th in the morning at the Aquatic Center playground to spread three truckloads of bark chips! This will be all hands on deck with both Rotary Clubs, Interact and more. If you can help out, it’s a good idea to bring gloves and if you’ve got shovels or rakes that could be used to move those bark chips, that would be a huge help. Sign up https://signupschedule.com/noonrotary So far 8 have signed up. We need lots more than that. Here’s your chance to put your muscle behind our saying “Service Above Self”. 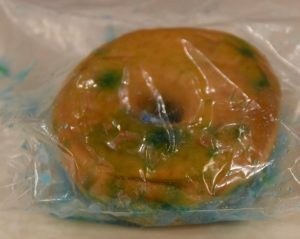 And Jim promised donuts so we know Om will be there! You’ll be hearing a lot about the Auction, March 23, 2019. It’s the biggest effort our club makes each year and with the downturn in the income from Rota-Dent ($100,000 to $50,000 annually), if we don’t step up and make a lot at the auction, we’ll not be able to give out 50+ scholarships and support all the community projects we’ve been able to do. We need EVERY ROTARIAN TO PARTICIPATE. We’ll work with you to find the right match. Talk to Denise Bacon, auction chair, denisebacon@aol.com or Leah nplleah@yahoo.com to get signed up for a committee. We’ll be connecting with you! 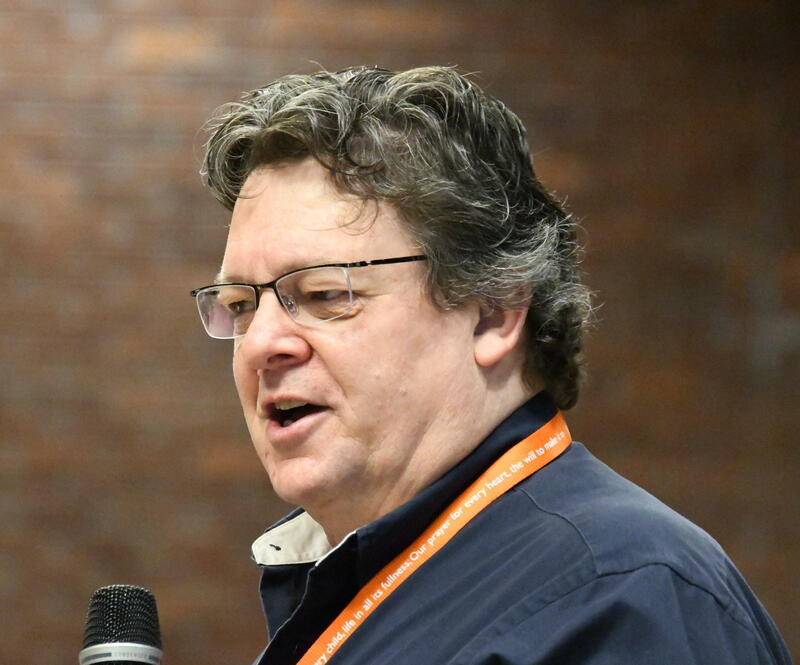 Also, Tony Lelack reminded us to ask NOW for contributions from larger companies. They need more time to go through their channels. And if they can’t do it for the 2019 auction, switch it up and ask for the 2020 auction! Laura Tilrico reported there were some extra funds from the money we sent to Guatemala for earthquake relief and the Rotary Club in Antiqua used them for repairs to the school. The Nepal project is moving along with Laura getting more info to show that the app for medical diagnosis can work. She is really putting a lot of work on this for the people of Nepal. Thank you Laura. Walter Want shared a special Veterans Day event at Evergreen Aviation Museum on November 11th from 9 am to 5 pm. The Vietnam Air War Experience Exhibit Grand Opening will be held that day. Memorabilia from the era, such as POW/MIA bracelets, flight manuals, flight suits as well as aircraft will be on display. Walter will be sharing his experiences at the event as well. Tony LeLack and his gym Excell Fitness, is again collecting turkeys for FISH. You can drop off a turkey at the gym, or even give him cash. Over the years they have collected thousands of pounds of turkeys for the community. Make sure you get your turkey to Tony! Our special guest Mayor Bob Andrews was honored with a Paul Harris award by Mike Caruso. Mayor Bob has embodied Service Above Self in his 12 years as mayor and his efforts are much appreciated. Denise Bacon, Rotarian and City Councilor, introduced Mayor Bob with just a few tears. 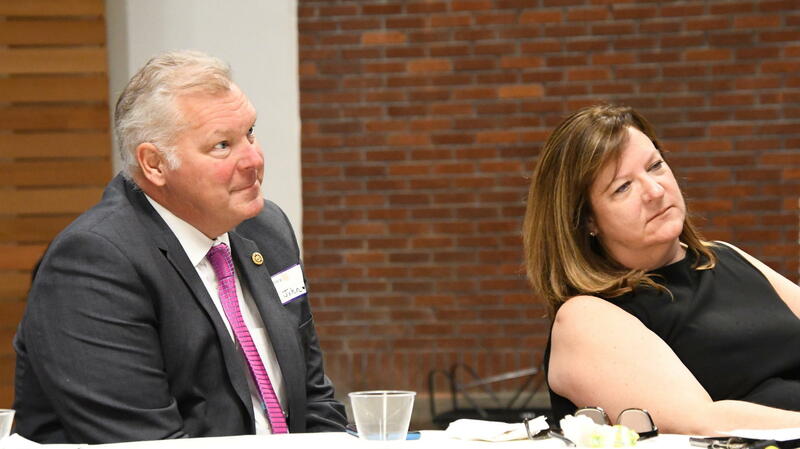 He has been an advisor, friend, and father figure to her as she became involved in city government and as she said, she owes so much to his mentorship to her over the years. Mayor Bob started with “Hi, I’m Bob, a recovering bureaucrat” He worked in state government for 30 years and then in retirement served on Newberg City Council for four years before being elected Mayor in 2006. Service to his community is what he does! In his years as mayor he has realized that many don’t really understand how local government works and so he shared a bit of a civics lesson with us. Newberg was incorporated as a town on Feb 21 1889. And four years later on February 10, 1893, it became a city. Today Mayor Bob likes to say we’re a small city, with the best of both sides because of the people in our city. 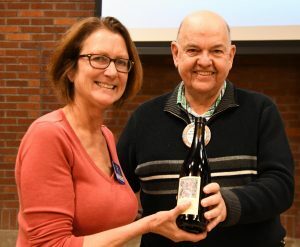 He as seen Newberg recognized as a community of giving and it is groups like Rotary and Kiwanis (he’s a Kiwanian, but we won’t hold that against him!) that enhance that reputation. The city of Newberg is governed by the city charter which is like the constitution and it is approved by the voters. The Council can enact laws. The Council and mayor are advised by many citizens’ advisory committees; Planning Commission, Library Board, Rate Review Committee and many more. These are all made up of citizens who learn about an issue and make recommendations. The city’s vision statement; “Newberg will cultivate a healthy, safe environment where citizens can work, play and grow in a friendly, dynamic and diverse community valuing partnerships and opportunity” drives the Council’s actions. And the mission statement: “The City of Newberg serves it citizens, promotes safety, and maintains a healthy community” further defines what the city works towards. We are now up to date on our strategic plans, the documents that help to shape our community. They are developed with citizen input and they don’t just sit on a shelf. We’ve seen lots of growth at George Fox University with their facilities, their students and the programs they offer to students. The Waste Water plant has grown and now provides non-potable water for landscaping. You could see the pride in Newberg the Mayor has as he shared what has gone on for this 12 years in office. When asked what he’ll do in “retirement”, he said REST. But he’ll keep busy with hobbies including woodworking, reading and he has promised his wife he would clean the garage. 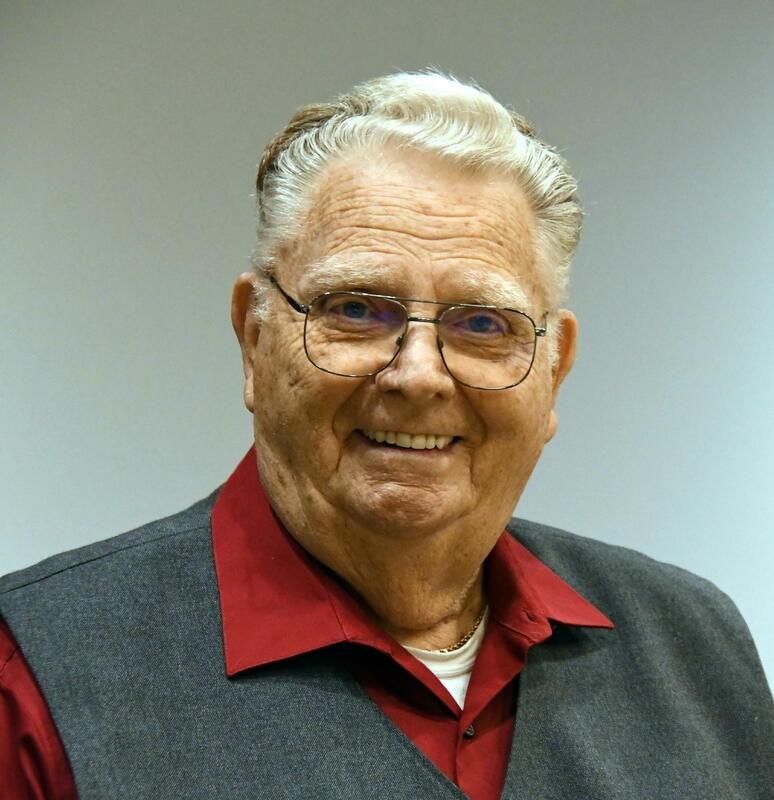 Thank you Mayor Andrews for your years of service to our community. 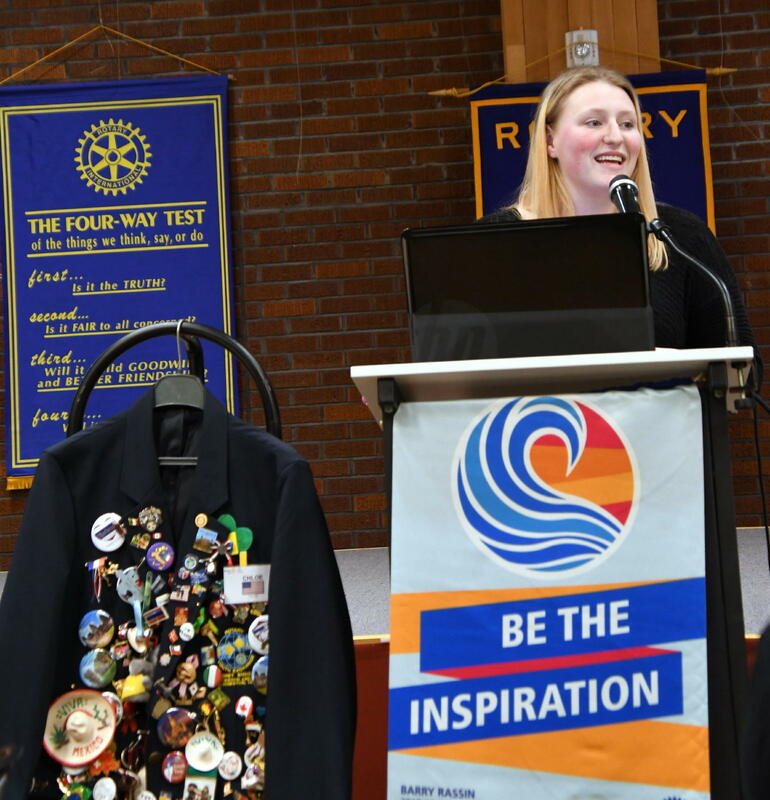 Leah’s efforts with this report are typical…for her…examples of Service Above Self…and Rotary in Action! AND…..next week’s meeting, November 7, will be the Rotary Classification Talk by Ivan Estrada…at the Cultural Center.